"The results suggest a helical structure (which must be very closely packed) containing 2, 3 or 4 co‐axial nucleic acid chains per helical unit, and having the phosphate groups near the outside." 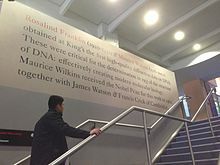 ^ "The Rosalind Franklin Papers: The Holes in Coal: Research at BCURA and in Paris, 1942–1951". Profiles.nlm.nih.gov. Retrieved 2013-07-25. ^ Franklin, Rosalind E.; Gosling, R. G. (April 25, 1953). "Molecular Configuration in Sodium Thymonucleate" (PDF). Nature. 171 (4356): 740–741. Bibcode:1953Natur.171..740F. doi:10.1038/171740a0. PMID 13054694. ^ Staff (18 December 2013). "Mary Ann Liebert to Receive Award for Stem Cell Education at World Stem Cell Summit in San Diego". Biotech Week. Archived from the original on 11 September 2016. Retrieved 9 July 2016 – via HighBeam Research. (Subscription required (help)). 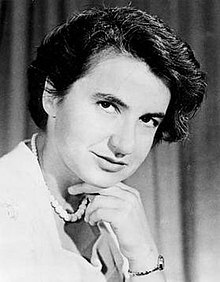 ^ "ESA's Mars rover has a name – Rosalind Franklin". European Space Agency. Retrieved 2019-02-07.